Tragedies like the Marjory Stoneman Douglas High and Sandy Hook Elementary school massacres eventually fade from view, blunted by other mass shootings and the passage of time. But for the survivors, the pain may never end. 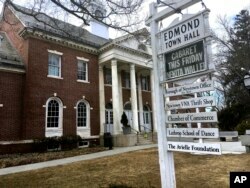 Signs hang outside Edmond Town Hall, a building that houses a community theater and offices, in Newtown, Conn., March 25, 2019. Jeremy Richman, father of Sandy Hook Elementary school shooting victim Avielle Richman, was found dead Monday at the building where he had an office. "It's not a foregone conclusion that this will happen to everyone who's been exposed to this, and the majority of people who are suicidal don't go on to die. They go on to recover and live," she said. FILE - A student at Marjory Stoneman Douglas High School weeps in front of a cross and Star of David for a shooting victim while a fellow classmate consoles her at a memorial by the school in Parkland, Florida, Feb. 18, 2018. The girl said she fears not every Stoneman Douglas student who needs counseling is getting it, and noted that some teachers seem uncomfortable talking about suicide and simply want to move on. 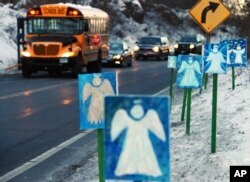 FILE - A bus traveling from Newtown, Conn., to Monroe stops in front of 26 angels along the roadside on the first day of classes for Sandy Hook Elementary School students since the Dec. 14 shooting, in Monroe, Conn., Jan. 3, 2013.